Large, newly renovated, luxury penthouse apartment with massive south facing terrace overlooking the sea. All rooms have access to the terrace or to the balcony with views of the Nice hills. The open-plan living area has a fully fitted American kitchen and is tastefully furnished to a very high standard. One double bedroom with access to front terrace has an en-suite shower/WC. The other double and the twin room, both with access to the balcony are situated next to the main bathroom, with bath, shower,basin and WC. There is also a cloakroom in this area with basin and WC. The airconditiong is remote controlled and each unit works separately. It was close to the beach ( 3 minute walk) and the apartment was spacious, clean and contemporary in feel. We loved having our breakfast on the terrace each morning before getting on with our day. The rental also provided us with all that we needed for the beach - towels, mats, water shoes. This is an excellent apartment in a good location, equipped to a very high standard. For the sake of brevity we'd like to endorse Viviane P's review of June 2017, which is an excellent summary of our experience. There are still major roadworks outside the building (Rue de France) but the dust and noise were negligible, and did not adversely affect our stay at all. The best apartment we've ever stayed in! Eve's apartment is absolutely stunning! I would recommend you visit it asap!! The whole apartment is finished to a very high standard with everything you could possibly want whilst on holiday. The linens, pillows and towels were beautiful and the beds were very comfortable. We holidayed with our son and his fiancé and we chose the back bedroom as it had a gloriously large bed. Ours didn't have the en-suite but the bed size took priority for us. The air conditioning in every room worked really well and was quiet. The bathrooms were gorgeous and modern and the showers glorious! The kitchen area was beautiful and new and fitted with all appliances including boiling and chilled water on tap! The cutlery, knives, utensils, cookware was of a high quality and plentiful. We had a small issue with the electricity tripping a few times but I rang the local contact Joanna and she was so helpful and there was a simple remedy which worked immediately. I loved how homely the apartment was with a cupboard filled with mats, umbrella's, body boards, beach toys and swimming shoes (the beach is large shingle). The living area had a high quality sound system and television and lots of squidgy seating and cushions. The outside terrace was just as beautiful as the inside. I could go on and on but I think you get the gist on how amazing this apartment is! The location of the apartment is just a few minutes from the shops and beach, we swam every day in the turquoise sea which was incredibly warm. The stroll into the old town along the Promenade des Anglais is about 20 minutes and a lovely walk. We had never visited Nice before and we had a great time exploring all that it had on offer. We also caught the train to Monaco's Monte-Carlo and walked the F1 route and visited the casino and the castle. It was a very enjoyable day. There are lots of major road works going on in Nice and this includes the road outside the apartment. We never heard roadworks during our stay and as the apartment is on the 7th floor you can only see it if you hang off the balcony (not recommended). It in no way detracted from us enjoying our holiday. I would strongly recommend Eve's apartment for anyone visiting Nice for work or pleasure, we felt very fortunate to have found such a gem. The apartment was prefect for my group of 5 friends visiting Nice for a few days. The apartment itself was just as beautiful as it appears in the pictures and the terrace was perfect for sunny breakfasts and a glass of wine as the sun set. It was only a quick walk to the beach and about a 20 minute walk to the station, with Monte Carlo and Cannes just a short train ride away if you want to venture further afield. Both the owner and Joanna were very easy to deal with - I would recommend this property in a heart-beat. This apartment was perfect for our family of four! Our adult sons had their own bedrooms, plenty of space to spread out. Just a block off the promenade and we could walk to the train station and old town easily. The Terrace had such a lovely view of the sea and a great place to unwind after a day of sightseeing. We did cook a meal in and everything was there in the kitchen that we needed. There was a lift to get you to the 7th floor but we quite liked using the steps for more exercise! Joanna was there to meet us (we where a tad late due to the rail system) and was so helpful with any question or needs we had. Thank you Eve and Joanna! We had a lovely stay last September for 5 nights, 5 ladies from Dublin, the apartment was perfect for us. We did not cook in but the kitchen was stocked with all the utensils you would need. The apartment is spotless, lovely decor and Joanne was very helpful. Loved having a glass of wine on the superb terrace looking at the views and the location was also very central to the beach, shops and a 15 min walk to the train station. Thank you Eve, we hope to be back again. 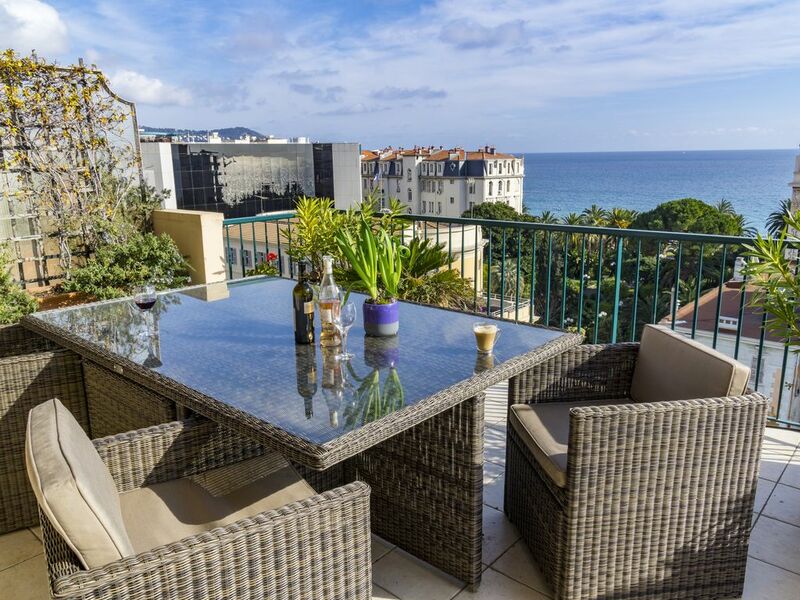 The appartment is situated on rue de France which is one street back from the Promenade des Anglais. The beach (both private and public) is 5 minutes walk away(less if the traffic lights are in your favour) and there are several shops,restaurants, bars and bakeries within a couple of minutes walk. Tha main supermarket is 5 minutes away and if you run short of money the bank is next to the front door of our building! The centre of town (Massena) is no more than 10 miutes away.the old town 20 minutes...if you're feeling tired or very lazy the bus stop is just across the road! .